S&J Collectibles through Jules Budd is actively involved with Lift for Life, Mercy Ministries and Grace Church through involvement on various committees and Board of Directors. Also, through donations and support of various events. S&J Collectibles supports the Isaac Bruce Foundation, through donating picture framing and publishing of art for various fundraisers. The custom framed Limited Canvas Edition of 80 canvases and 3 autographed by Isaac Bruce. A major portion of all purchases supports the foundation. 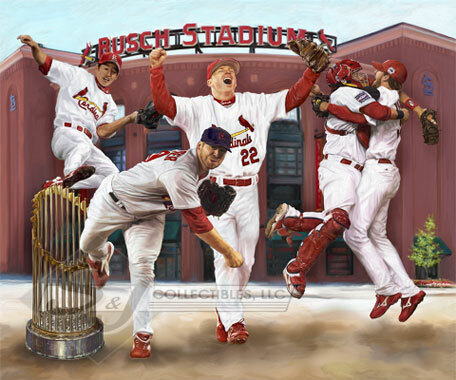 The new 2006 World Series - Joy of Victory helps support the following organizations: Mid-American Transplant Services, Angels' Arms, and the Andrew Vidal Memorial Scholarship when purchased through these charitable groups. 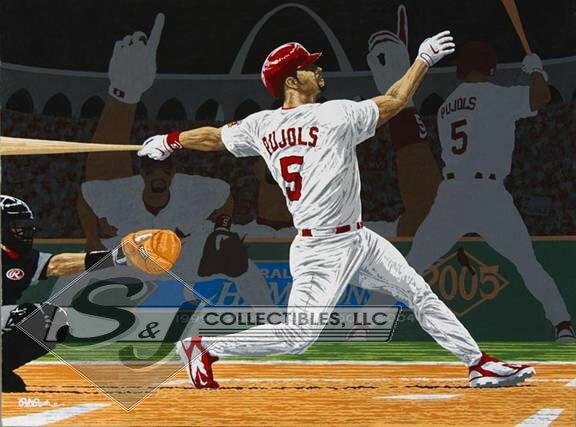 S&J Collectibles supports the Pujols Family Foundation through donating picture framing and publishing of art for fundraising efforts. Rick Rush's new image of Albert Pujols has been a huge success for raising funds. S&J Collectibles will donate 40% of the retail sale price of the framing of this serigraph for all purchases through the foundation. S&J Collectibles also supports the Faulk Foundation, Torry Holt Foundation, Youth Conservation Councils and many others through financial and art donations. S&J Collectibles is the proud founder and sole sponsor of the Parkway South High School Budd Family Art Scholarship. Currently two talented artists sit on the judging panel, Rip Kastaris and Lisa Ober, plus a former student of PSH Joanna Budd. S&J Collectibles also supports Angels' Arms through commissioning and publishing art for fund raisers and private donations. Working with a talented artist Lisa Ober who in her own right is actively involved with Angels' Arms. Jules Budd of S&J was introduced to Angels' Arms through Lisa. S&J also supports a wide variety of local charities through art donations and private funds. You can view artwork for sale below where a majority portion goes to support Angel's Arms.